← LINDY EDWARDS. Identity Politics is central to the current political crisis, but not for the reasons Paul Kelly argues. CHRIS MILLS. Australians’ Choice: A Wasted Hourglass or Golden Egg Economy? These simplifying images of Australia’s future Federal, State and Territory economies have been deliberately chosen to be evocative and provocative. Our stark choice is to continue to pursue the Neoliberalism ideology that is failing so many ordinary Australians, of take a giant leap back to a future of social equity and a fairer go for most. The Wasted Hourglass economy is one where there is a rich and growing wealthy upper-class, enjoying the benefits of low taxation and ‘mates rates’ for public contracts, grants and investments, especially real estate. At the bottom, there is a growing under-class, mostly young people, trapped by impoverishing support from Newstart allowances that have not changed for two decades. Homelessness is rife and growing. Those with mental illness and substance addiction are abandoned. Women suffering from domestic violence have limited access to refuges or legal aid. In the middle-class where most Australians live, wages have stagnated while living costs rise. In real terms, this group is slowly losing ground. This is a ‘Trumpist’ economy that encourages far-right groups and extinguishes social equity, the life blood of a healthy country. By contrast, the Golden Egg economy is one where there are a few inspiring individuals at the top ‘pointy-end’ of the egg. They largely get there by merit, hard work and occasionally by sheer luck. There will be a few at the rounded bottom of the egg, those left behind by bad management, ill health or misfortune. Most Australians in the middle enjoy the benefits of a thriving, multicultural society, with interesting and secure jobs, affordable housing and opportunities for advancement. If we overlay the two shapes, we can examine the overlaps to see the differences. In the middle of the Golden Egg, the economy has employment in education, especially vocational ‘tradie’ training, public hospitals have short waiting queues, institutions care for the mentally ill and rescue people from addictions, public housing shelters those who cannot afford to buy their own home, public transport helps people transit to work and entertainment. Refuges shelter those suffering from domestic violence and funds legal redress. Electricity prices plummet as new transmission lines, pumped-hydro and battery storage ‘firms’ the grid. Enabled by ‘firming’, fair-dinkum renewable electricity is on track for carbon-free generation by 2050, and climate-change is managed. Larger Regional centres are developed to encourage people to pursue high quality lives outside the overcrowded and expensive capital cities. Australia finally gets a network of high-speed rail. Most of these facilities are provided by Federal, State and Territory Governments in a mixed public-private economy. Next look at the overlap in the Wasted Hourglass economy. At the base, there are the left-behinds being badgered by Newstart into competing for jobs that don’t exist; there is a growing number of homeless, addicted and abused. At the top, we find Secretaries of Departments being paid more that the Prime Minister or Premier they publicly serve. Non-executive Public Servants are paid more than the Principal of a school with a couple of hundred students and forty staff. Executive salaries have moved into the millions-a-year bracket. Universities receive public funding to generate a glut of graduates for whom there are no employment vacancies. A national pastime is deriding the Legal Profession, so enjoy an examination of the Graduate Lawyer Glut. Using a rough approximation, Universities charge taxpayers about $100,000 to graduate a lawyer, HECS recovers about $40,000, leaving the mug taxpayer $60,000 to cover the cost of each unemployed lawyer. An estimate of the size of the unemployed lawyer glut is 60,000. If true, this is $3.6 billion dollars of useless training that could have been invested in nation building. The emerging theme is that there are policy failures and distortions in our Wasted Hourglass economy that provide the opportunity to fund a transition to a Golden Egg economy. 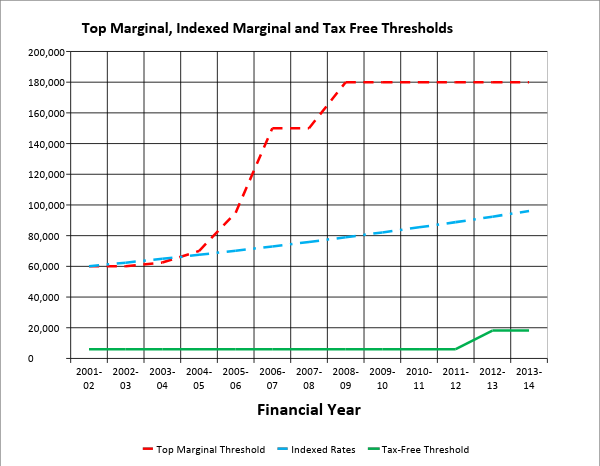 The widening gap between the red and blue lines is the forgone Commonwealth taxation revenue. Note that while those at the top end of town received a series of massive tax-breaks between 2002-08, it took until the 2013-14 budget for the battlers to get a meagre slice of the pie. At the same time, there was more budget pillaging in the form of Negative Gearing and Capital Gains Tax concessions on real estate. The result is that Australia has some of the most expensive houses in the world, benefiting a few and punishing young people who simply cannot afford to purchase a dwelling, especially when penalty rates are cut and wages stagnating. Some say that the after the stable door was deliberately opened, the gift horse has bolted forever. Getting the Colt from Old Regret back in the stockyard is possible but will take the political courage and recovery skills of a modern Man from Snowy River. Progressive taxation policy, the mainstay of delivering social equity, could redress the inequity of the rapid expansion of Executive Salaries. Rather than eliminate tax brackets to give additional income to the wealthy, Australia could add another tax bracket for example, at a taxable income of $400,000. Shocks are never a good idea in economies, so the top marginal tax rate could be 55 cents for each additional dollar, rising by 5 cents a year until the top marginal reaches 75 cents. Million-dollar salaries will continue to be paid, but additional revenue will flow back to the government to fund services and jobs that restore a fair go across the community. Recovering wasted University graduate funding is another example where restructuring policy can produce dividends. HECS places could be offered to fill the demand for graduates in the future economy, much like the old Commonwealth Scholarships, now being restored in States like South Australia. Savings can be made where there are surplus graduates by slowing entry until demand-balance is achieved. Another disastrous higher education policy has been the dismembering of Vocational Education Training. The urgent need for recovery has been recognised in States such as NSW and Victoria. Here is a good news story from NSW. Converting University waste into expanded vocational training is pure alchemy. Clearly, there is an intensifying battle for the political hearts and minds of Australians. On the right we have the Neoliberalists, whom Richard Denniss describes as Dead Right in the Quarterly Essay. In the centre and on the left we have an emerging view that it is OK for Governments to fund and operate hospitals, schools, public housing, public transport, renewable energy, and that they may do it with greater efficiency and public benefit than the Game of Mates assessed by the authors Murray and Frijters as ‘bleeding the Nation’. Proponents of the Golden Egg economy will no doubt be barraged by a chorus of complaints from the top end of town about ‘the politics of envy’. The centre and bottom end of town will respond with ‘no, it’s the politics of equity’. The power of democracy is that ultimately it is the people who will choose the structure of economy that best serves the nation. The billion-dollar political question that will be asked before 18 May 2019 is: in what type of nation do Australians want to live, and are they prepared to choose a government making hard choices which might include higher taxes, a cessation of Negative Gearing and a reduction of Capital Gains Tax concessions, and higher education reform to fund the services and jobs that benefit middle Australia and rescue the disadvantaged? The fiscal arithmetic is that the Wasted Hourglass economy will have lower taxes and diminishing social equity compared with the Golden Egg economy of higher taxes and a fairer go for most. The shock and awe for the Neoliberalists is that the Golden Egg economy will provide more jobs and growth than the Wasted Hourglass economy. Considering the outcome of the next election, Bill Clinton may still be on the money with his assessment: ‘it’s the economy, stupid’. 3 Responses to CHRIS MILLS. Australians’ Choice: A Wasted Hourglass or Golden Egg Economy? Thanks, an easy read of many issues. Solutions are the missing element in an unfortunately narcissistic world riddled with conflicts of interest. Politicians are riddled with that constraint. Confidence in the sales arena is paramount. ScoMo is little more than a fairly moderate spuiker. The reality is that most political operatives have modest mental bandwidth, yet this mirrors society. There is a bell-shaped curve of results to this criteria yet that is little doubt that “communication with influence” is the main driver. I submit that real debate is replaced by restatement for the respective base. Elections are futile and merely increase polarization. Democracy cannot survive the internet, read misinformation, age. A new model that includes scrapping the UN should be debated. A levy on production must be considered to overcome the ease of tax avoidance by multinational and oligopic corporations. A good, easy read with sensible ideas to create a more fair and just Australia… I would add that an Inheritance Tax should be levied, and Trusts should be heavily regulated and restricted in their tax avoidance.